As a result of my allergy-friendly elimination diet, all dairy is a complete no-no. What’s a girl to do when it’s 85 degrees in May and she has a hankerin’ for ice-cream? Make sorbet that’s what! 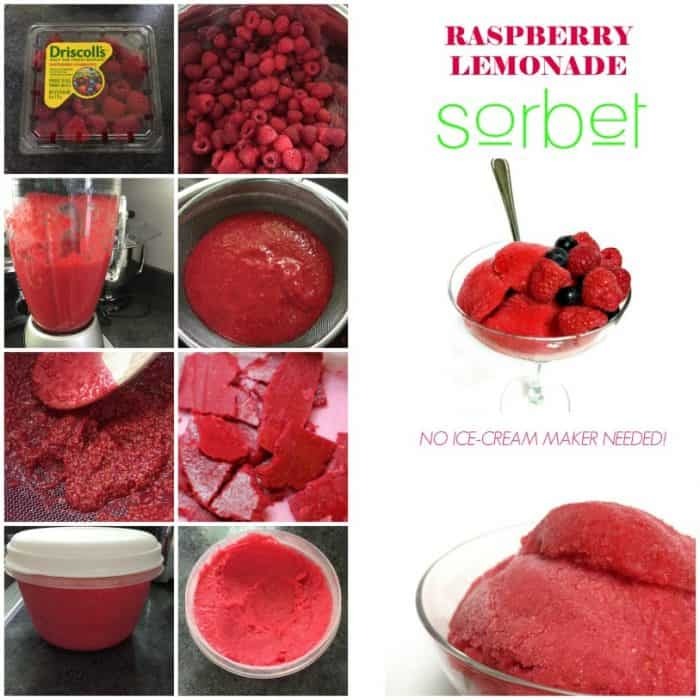 This yummy Raspberry Lemonade Sorbet is easy to whip up and doesn’t require an ice-cream machine. PLUS it only has 4 ingredients: Driscoll’s raspberries, lemons, sugar and water. This was my first time making sorbet and it turned out really well. It’s creamy, packed full of flavor and really is the perfect raspberry dessert. You could easily switch up the ingredients to whatever tickles your fancy, too. Once this batch is gone I’m going to try it with some dairy free dark chocolate chips. YUM! My husband was quick to point out that this would make a fabulous adult beverage or dessert. Just add some rum or tequila. Since alcohol doesn’t freeze it would make it creamier, too! Let me know if you try this recipe and what yummy flavor combinations you come up with! 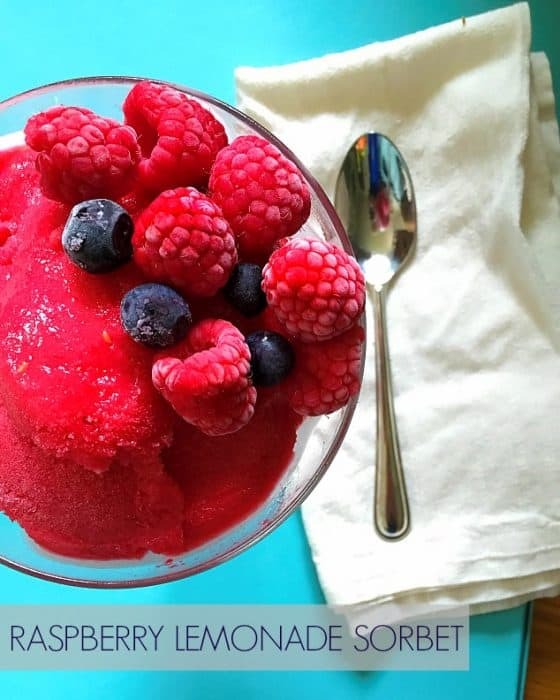 A delicious raspberry lemon sorbet. No ice cream machine needed! In a 2-quart saucepan, bring 2 cups water and sugar to a boil, stirring to dissolve. Reduce heat to low and simmer, without stirring, to make a simple syrup, for 5 minutes. Pour the syrup into a medium bowl, stir in vanilla extract, and transfer to the freezer to let chill for 15 minutes. 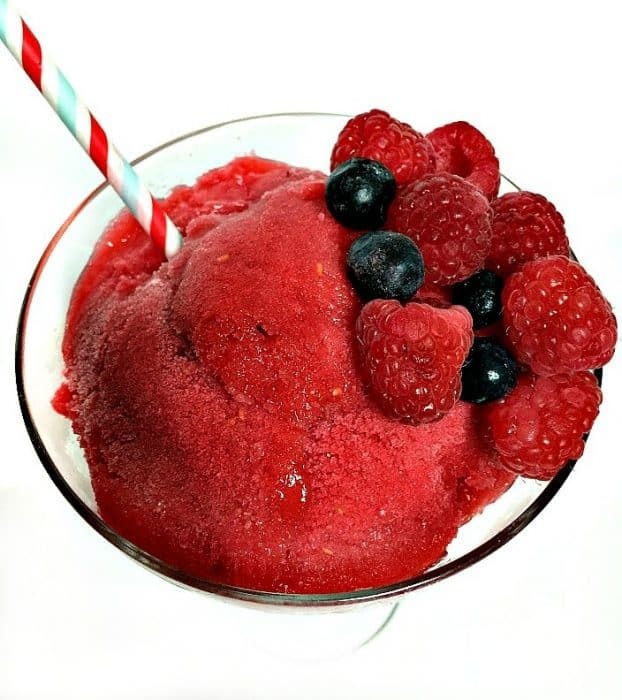 Purée the raspberries with the syrup in a blender or food processor until smooth. Scrape the purée through a fine sieve into a bowl; discard the seeds. Stir lemon juice into the raspberry purée. Pour into a shallow non-stick cake pan or cookie tray. Remove from freezer and break the mixture up into pieces. In small batches, put into the blender and liquidize until smooth. Pour into a container (I used regular tupperware) and freeze. Gorgeous raspberry sorbet Jenna!!! And dark chocolate chips! All over that. Love chocolate and raspberries. Can’t wait to try this! Chocolate & raspberries are the ultimate combo!! Thanks for stopping by, Allie! 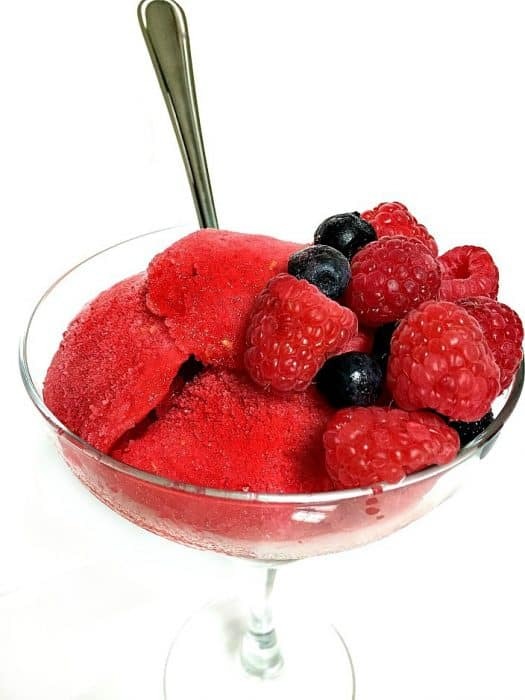 I could go for a dish of this sorbet, right now! Beautifully done.